Readers from this blog from South America, Africa and Asia – I would really love to discover perfume brands from your parts of the world! If you have some recommendations or names or links please enlighten me? Send me an e-mail, tweet or post a comment. Thank you! In 2013, I hope to see more of the perfume related accessories that this past ear has shown some curiosity for. At Pitti Fragranze, an annual perfume fair, it seemed that this is indeed an area that will grow. If it does, it could create a very interesting intersection for perfume and fashion, art and design. 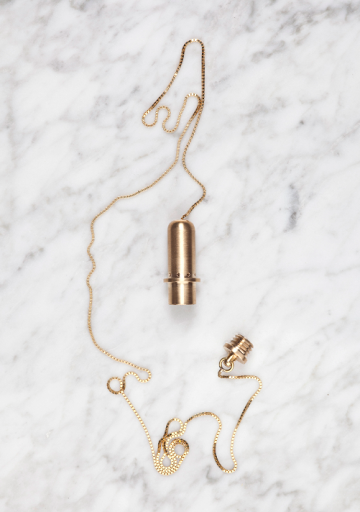 I believe – and hope – that we will see more perfume jewellery. Necklaces with some kind of container, amulets etc are classical pieces that unfortunately seem to have been forgotten. (I love my vintage necklace from Chanel…) It would be interesting to see a contemporary take on such objects, and what other ideas there are out there. I have found some items such as Aftelier cases and these earrings from Lisa Hoffman. (For vintage lovers go to the auction houses that sometimes have some really exquisite items, or here.) But I am curious to see more of a contemporary twist. A more edgy, avant-garde, rock feeling. Dutch designer Jody Kocken has created some pieces that I would definitely like to wear. When she discovered that she was allergic to perfume, she looked for solutions that would enable her to still wear a fragrance. 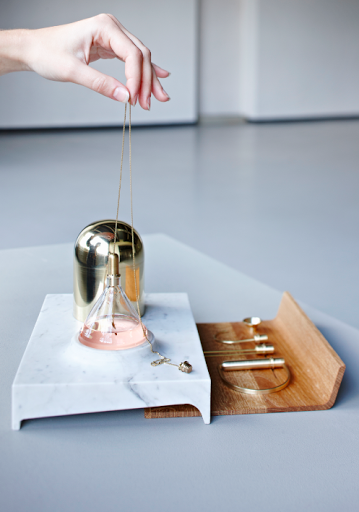 She came up with and designed her own solution, ‘Perfume Tools’, a series of industrial jewellery pieces. The pieces can be attached to the opening of a perfume bottle, the tools then absorbs the scent and work as worn fragrance diffuser. 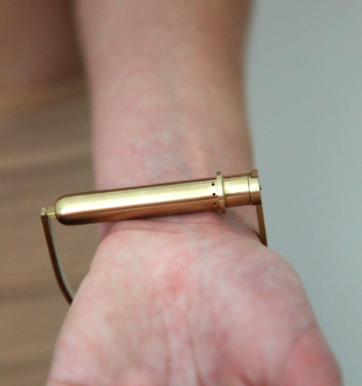 In places where the skin is most vulnerable, the precious metal is warmed up so that the scent can travel. Any skin contact with the perfumed liquid is avoided. This poses some questions of course as we often speak of how the perfume evolves and is affected by a person’s skin. In this case, this dimension is lost. But if the option is to never be able to wear perfume at all – the I think these pieces are an excellent idea. Seeing that quite a lot of people are allergic or sensitive to perfumes, I think all kinds of solutions adapted to this situation are an interesting area to develop. If any perfume maker is reading this I would really love to hear your thoughts on this way of wearing perfume? Are some perfumes more suitable? Can something be done to create perfumes that can compensate the lack of skin exposure?